The Natural Health Service uses the natural environment to improve the health and wellbeing of individuals, families and communities across Merseyside and North Cheshire. We see the natural environment – our parks, woodlands and other green spaces – as a health asset; places that can contribute to the prevention and treatment of physical and mental health conditions. 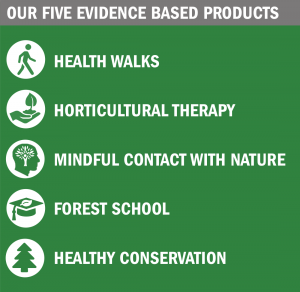 Our evidence based products use the natural environment as the basis for their delivery and effectiveness and are available to the NHS, local authorities and other commissioners as part of an holistic approach to health and social care.